Keep your wee one warm and comfy with this lovely Neave crocheted baby blanket. The cozy and beautiful design will definitely brighten your baby’s space! It also makes for a truly thoughtful gift to bring to a friend’s baby shower! In fact, this pattern is a great project for intermediate crocheters looking to craft more crocheted items for their brood. Once finished, the crocheted blanket should measure approximately 39 inches by 39 inches in size. In metric measurements, the completed crocheted piece should be about 100 cm by 100 cm. 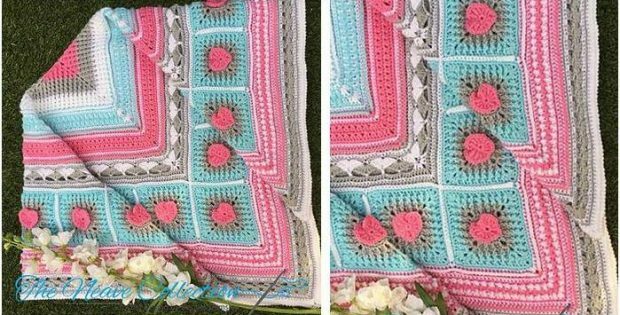 This crochet pattern is a wonderful design by Debbie Hemsley. In fact, you can access the FREE downloadable pattern for this lovely crocheted blanket from The Neave Collection website. Featured image: The Neave Collection – thank you!